Note: This is the first of a three-part fiction piece. It is the product of a residency at the Louis Armstrong House Museum and Archives, where the author had access to the condolences written to Lucille Armstrong upon the death of her husband. The short quotations used are valid under the fair use act. The E train at 3:00. You know what I’m talking about. The E train. It’s air-conditioned now, and has those little light-up schedules on either side, where you can see what stop you’re at, where you’re going, what lines you can transfer to (although you probably won’t want to leave the air-conditioning). The ride’s a little smoother, and at 3:00, it’s not quite packed yet. Rush hour is coming— you know it, I know it— but it isn’t there yet, and you can remain in the car between boroughs without feeling claustrophobic, and maybe even get a seat. It was 3:00, well, okay, it was 3:14, on the E train, and everyone was plugged in. Mostly to iPods, although there were the occasional technological deviants who had those other mp3 players, feeling special because they hadn’t succumbed to a brand name, and meanwhile wearing Cons on their feet and Moleskines in their back pockets. Those who weren’t into their music were busy on Blackberrys, some Blackberrys were accompanied with music, and a couple even had iPads (those were the ones who had procured seats immediately). Pick your plug—it’s New York, after all, and what kind of city would this be if you couldn’t get your electronic drug of choice? If someone on the E train had decided to unplug at 3:00 (by which I of course mean 3:14), that person would have noticed the man with the horn smiling at the boy in his stroller, monitored, but not actually watched, by his iPad-entranced mother. The boy was only three, so he wasn’t plugged in, and he was already three, so he was getting quite comfortable making acquaintances, and he waved at the man with the horn, who chuckled and said something to the woman next to him. She was lovely, with a softer smile than the man with the horn, though it was just as kind, and her hair was piled high up on her head in a classic and elegant way. Her eyes were striking, because they were ever-so-slightly bigger than most, and her brows were articulate, solid and beautifully arched, giving her a look of combined wisdom and sweetness. If someone on the train unplugged, they would hear the woman call the man Satch, and ask him if he didn’t have another little horn for that handsome little boy. They would hear the man call the woman Pearl, and tell her no, he only had the one horn, but maybe if he held it careful, the boy could get a real good blow or two out of it. A man sitting opposite the two looked up from one of the free subway papers that are always given out at the entrances. He wore a double-breasted jacket, had a handsome pencil moustache and a gentle but oh-so-slick smile, one that, had they unplugged, the two ladies sitting next to him would have swooned for. “You never did do anyone harm along the way, Pops,” he said to the man with the horn. He took a cigarette from his sharp-looking jacket and patted around for a light. A burst of laughter came from the other end of the car, a cackle more than anything, low enough to rival the voices of the men, and with almost as much static as the man with the horn. “Winston Churchill, the Prime Minister?” the blue-eyed man asked the others. “A cat named for a cat,” said the man with the horn, laughing. It was now 3:17. The E train was approaching midtown. Some people got on, others got off, but no one unplugged. “We’re almost downtown,” said the man with the paper. “Remind me why we’re going there? I forget things so quickly,” said the woman who’d had Winston Churchill the lion. She was making faces at the little boy, who was laughing delightedly. “Oh, of course, Darling! How exciting!” And she turned a cartwheel right in the center of the train car. The other four laughed, and the little boy clapped his hands—he was very well-mannered at three. “Do you think any of these folks are going to join us?” the blue-eyed man asked, looking around. The man with the horn said, “It’s a real shame we can’t bring this one with us.” The little boy had taken his hand and was gripping two of his fingers tightly. “Always a sucker for the kids,” said the blue-eyed man. “And why shouldn’t he be? I adore children,” said the woman who’d turned the cartwheel. It was 3:26. The train was starting to fill up. “Time to leave, all,” said the blue-eyed man. They gathered their things, and moved towards the door. The train doors closed behind them. The woman who’d looked up for an instant shook her head and returned to her iPad. The little boy kept waving as the E train pulled away, and 3:30 appeared on the digital clocks on the tops of the cars. The rush was about to begin. 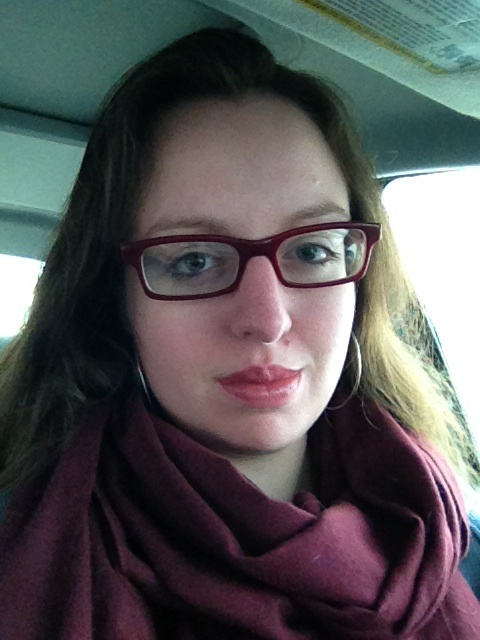 Melissa Bobe holds an MFA in Creative Writing and Translation from CUNY Queens College. In 2011, she was a writer-in-residence at the Louis Armstrong House Museum. She founded a creative writing workshop for teens at her public library, and has also taught writing at Queens College and at Rutgers University, where she is currently pursuing a PhD in English literature. Her work has appeared in Anomalous Press, Steel Toe Review, and The Glass Coin. You can keep up-to-date with her on Twitter (@abookbumble). This entry was posted in Fiction and tagged fiction, jazz, Louis Armstrong, Melissa Bobe, Pops, Satchmo, subway. Bookmark the permalink.